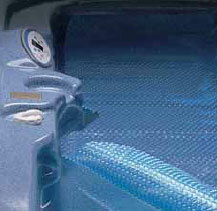 Reduction of moisture between your spa's water and the insulating cover reduces energy bills. Chlorine and Bromine sanitizers "gas-off" your spa. Adding a floating cover reduced costly chemical evaporation. Evaporation is the delivery vehicle for contaminants to reach your insulating spa cover . By reducing evaporation, you reduce the amount of contaminants "gassing-off" and breaking down the structure of your insulating spa cover. Help your customers start saving money today with the addition of one of these floating spa covers. Available size is 8' square ... just cut to size.